Jonathan Gagné (on the left) receives his award from Philippe-Edwin Bélanger (on the right), president of the ADÉSAQ. Credits : Acfas – Hombeline Dumas. Jonathan Gagné, a former student and a collaborator of iREx, receives one of the Acfas excellence awards 2016. This award, attributed by the Association des doyens des études supérieures au Québec (ADÉSAQ), recognize the best thesis in natural sciences and engineering. Jonathan completed his PhD at iREx, Université de Montréal, in 2015, under the supervision of David Lafrenière and René Doyon. His thesis was on the detection of low-mass stars and brown dwarfs (objects less massive than stars). Now a postdoctoral fellow at Carnegie Institution for Science, Washington DC, Jonathan continues his research projects trying to identify objects that have masses similar to giant exoplanets, but that are isolated in space, without an host star. Earlier this year, Jonathan received the prestigious Plaskett Medal from Canadian Astronomical Society (CASCA) and Royal Astronomical Society of Canada (RASC), a recognition awarded every two years to the most outstanding Canadian doctoral thesis in astrophysics. 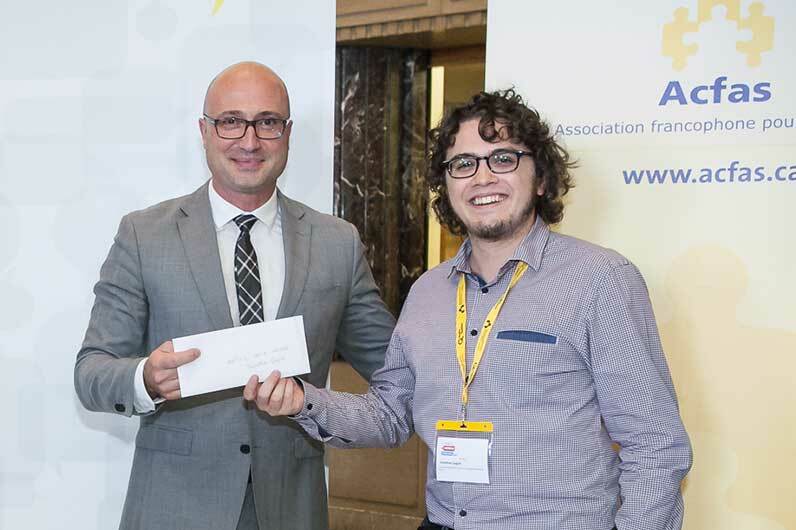 Jonathan received his ADÉSAQ prize at the Acfas award ceremony for early-career researchers, that took place during the « Journées de la relève en recherche » at Université de Montréal Friday, September 23.
iREx congratulates Jonathan for this remarkable award. The Association francophone pour le savoir – Acfas is a non-profit organisation that brings together actors from various sectors (academic, public, semipublic, industrial and scientific communication) to contribute to the development of the sciences in Quebec and in the rest of the Canadian francophonie. The Association des doyens des études supérieures au Québec (ADÉSAQ), is an Acfas partner organism that brings together all the managers in charge of graduate studies in Quebec universities, with the objective of promoting the development, the quality and the efficient organisation of graduate studies in Quebec universities. Each year, the ADÉSAQ gives three awards for the best theses in the three main research sectors (Health, Natural Sciences and Engineering, and Social Sciences, Art and Literature) at the ceremony organized by Acfas for new outstanding early-career researchers. « La recherche de naines brunes et étoiles de faible masse dans les associations cinématiques jeunes du voisinage solaire », Université de Montréal, 2015.